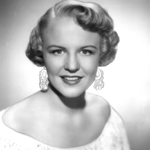 A selection of Peggy Lee big band arrangements for solo vocalist. Born Norma Deloris Egstrom in Jamestown, North Dakota Kentucky, she was a singer, actress and lyricist. She changed her name to Peggy Lee and set out for California at the tender age of seventeen. A series of fortuitous events resulted in her accepting a singing job in Chicago where she was spotted by Benny Goodman. She sang with his band for two years. Over her sixty year career she recorded extensively with Capitol Records and Decca Records and was the recipient of three Grammy awards, the ASCAP award, the President's award and was inducted into the Songwriters Hall of Fame. She passed away in 2002 and her ashes were laid to rest in Westwood, Los Angeles. Which of her big band charts are best known? Here are a few that are instantly recognisable. "Big Spender", "I Love Being Here With You", "Let's Do It" and "Why Don't You Do Right".